You just never know what you're going to get when Neil Young comes to town, because he has multiple guises to choose from. There's the folksy acoustic troubadour at one end, the noble-savage electric-guitar savant at the other, and numerous shades in between. 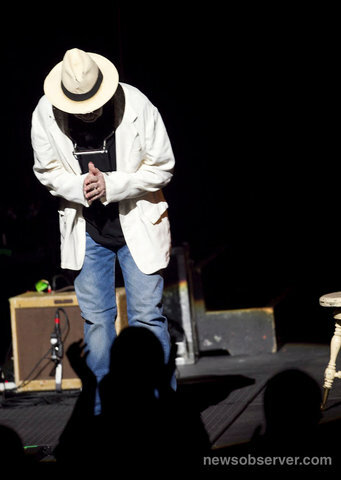 Between the apocalyptic tone of the minor-key guitar riff, Young's atmospheric harmonica and his haunting-as-ever cracked whine, "My My, Hey Hey" was particularly effective. But just as everyone was settling in, possibly hoping against hope for a greatest-hits set of nothing but the old classics, Young changed gears. Twisted Road Solo Tour Opens Tonight! Neil Young will be performing tonight at Durham PAC, Durham, North Carolina. Special guest Bert Jansch will open concert. Neil had a closed rehearsal last night on Duke's campus at Paige Hall because the DPAC was booked for the night. I got a tip from a friend that works there and sat outside listening to the entire rehearsal. Kids were walking by and had no clue who was inside. The sound was crystal clear. Some notes shook the building (Peaceful Valley Boulevard) and drew attention from onlookers, but only one person stopped and listened with me. It did not take long for him to figure out who it was. Another funny part was when Neil had some issues with the organ and they spent 15 minutes trying to fix some keys. It was like a personal concert. I went expecting so see his bus and that was about it, but this was the experience of a lifetime. I'm still blown away. Based on the rehearsal, the setlist appears to be identical to the previous legs. Concertgoers keep in mind that the merchandise table is cash only. Didn't know that when I went last year and had to scramble and borrow cash from my brother to get a tee shirt. Have a wonderful time. Can't wait to hear the reviews. There's a nice article with a very, very, very nice slide show about America's best record stores on Rolling Stone mag dot com. Tomorrow it's record store day over here in Europe... also in the U.S. of A? Guess so...? Check it out SH, it might give you some new connections to record stores on the other side of your country. Will there be something special from NY on record store day like last year's Heart of Gold? A fliprecord or something like that? @Carte Blanche - thanks for the early report. Will you be @ show tonight? if so, hope you can bring us a report. @Sandy - thanks for reminder! @BSM - thanks for link! Support the Independents! I will be there. I'll do my best to write down the set. I caught the show in Spartanburg and the rehearsal set last night appeared to be identical. Of course, it's Neil, so who knows what'll happen. He sounds absolutely incredible. I'm counting the hours...about 248 right now till Neil takes the stage (4/25, NYC). May everyone have the greatest time! ...anybody able to advise how best to order 'Treasure' vinyl issue for those of us in UK please. Many thanks. With regard to the t-shirt table on the tour - I can't believe how crappy the shirts are. I mean, just a total Piece of Crap. The material is 3rd rate and frayed at the ends of the sleeves - and I mean EVERY shirt for sale. Now, if you order directly from NY's web site, you get a much higher quality of shirt. The crappy quality may be the case with other bands and tours. But do yourself a favor and save your money - buy directly from Neil. Does it not work in the UK? I was a sleep at the wheel and missed the presale for Massey Hall. I never would have figured He would come back east from Chicago. I was able to get tickets for both nights when they went on sale today at 10AM. Not great seats but I was lucky to get them. I think both nights are sold out now. To see history in the making with Jonathan Demme really will be something . Counting the days for Upper Darby. Doug S. Warsaw N.Y.
Treasure pre-order is $50.00 for the vinyl- a bit pricey but if it is anywhere as limited as Le Noise was on LP- worth it! Plus, pressed a Pallas in Germany (I think?) which is the finest pressing plant in the world (RTI is great too). No, no special Neil stuff this year for RSD- Treasure is connected to the RSD people somehow but obviously wont be out tomorrow. I wonder if that was the original intention and(of course) got pushed back? I love that Neil is perfectionist about all the right things! Can't wait for next weekend! Enjoy the show everyone. Please keep us updated! Just returned from the DPAC. It was a great show. Neil seemed comfortable in his own skin and the crowd was at home with an old friend. The younger folks were well versed with material from the Le Noise with several hundred singing along. Us oldsters enjoyed the standards from the catalog. After 4 songs in the acoustical singer/song writer tradition, Neil picked up that old black axe and tore down the house. Hard to believe that much sound can come from one guy, with his own bass line supporting his top end lead work. Really fun and worth the go, for sure. If you can be, be there when he travels through your neck of the woods. Bruce in the piney woods. Neil waqs fantastic tonight n Durham. I wqsn't familiar with his latest album and was hoping for more4 of his familiar stuff, but what he palyede was awesome. Just hearing Ohio and Cinnamon Girl live was worth the price of admission. On a side note, Bert Jansch is a virtuoso guitarist, but I could not understand a word he said and he played 45 minutes. Neil is promoting his new record and the songs which he believes in.This is fantastic.On the other hand, I have found funny the predictions(also of so called experts)about the possible setlists. I appreciate that younger fans know and sing the newer songs. This should be the rule.I remember that in the european concerts the younger fans know the songs from the last records as well. Probably Neil isn' t going to bring this tour in Europe.I hope that the cameras at The Massey Hall at least can capture these shows. For the change.Buffalo Springfield shows represent a change.In the future, if Archives vol.2 is ready, we are going to see massive international tours for promoting this important release. looks like i don't need to run to richmond sunday to see this show. saw it..... exactly the same setlist and opener..... in DC last year. exactly. i guessed right that it would be the continuation of the same show. if you haven't seen it, i highly recommend it. but i am glad i saved the $ this time around. Aer said:I'm glad that I saved the $ this time around". Last year I have seen 3 concerts of the Twisted Road tour.This year I've tried to find some cheap flights for Toronto, but they were too expensive for me. Anyway, there aren't any good tickets anymore for these shows. It`s always so exciting when Neil is on tour, whatever and wherever he`s playing. You lucky people getting to see him, you seem to be where I belong! Andrea, I wouldn`t be surprised if you`re right about Neil not bringing the Twisted Road tour to Europe, fingers crossed for a visit from him next year. A Europe Tour in the winter should be a good thing.In my opinion all depends on the state of completion of Archives vol.2. Neil has going to have a lot of stuff in the can: Toast, Trunk Show, Archives vol.2, BS live, Le Noise Live(Massey Hall), Homegrown, Chrome Dreams, Oceanside, Budokan, seventies remasters.For promoting and selling all this material, he'll have to tour back in support for at least 2-3 years. And another new studio work is always a possiblity...Bringing back the Crazy Horse is not a folly in this state of things. 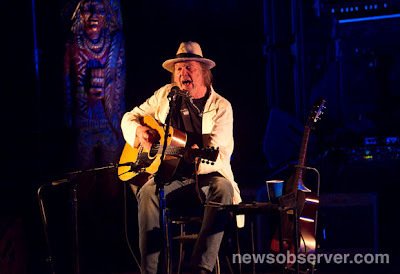 Saw Neil Young in Durham last night. It was the opening night of his latest solo tour, and as usual, was fairly unpredictable. Pretty good mix of old and new - I'm still not sold on Le Noise but it is a noble "experiment" and as a devoted NY fan I am used to his eccentricities....they are what make him the artist he is. I mean, I saw the Time Fades Away tour back in '73 and when everyone wanted to hear him play Harvest start to finish, he did the complete opposite, playing mostly new tunes, most of them very dark, that no one had ever heard before. Some people still haven't forgiven him for that tour, but I loved it and still think TFA is his best live album. Sure wish he'd release it on CD, though. Highlights for me last night were Ohio (best song of the night), Cortez The Killer, Down By The River, and Hitchhiker off Le Noise, all on solo electric guitar, I Believe In You on grand piano, After The Gold Rush on pipe organ and the opening acoustic trio of My My Hey Hey, Tell Me Why and Helpless. The Durham show rocked! I am still on a high from seeing such an intense, musical show. Watching and listening to him jam was awesome. With so many great songs, how can anyone be disappointed in the set list? I thought the set list was great and appreciated 90 minutes worth of music with no lame intermission. Everyone knows Neil Young does what he wants to and that is fine by me. 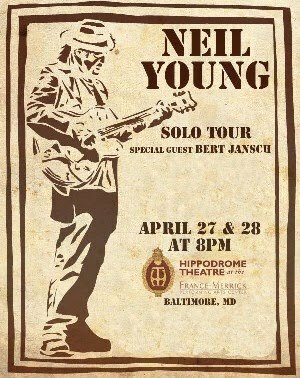 Buying tix for the Baltimore shows I guess Neil is all over the stage not on any particular side? @Anonymous (last post) he starts off middle of stage... stands slightly stage left for solo electric, all the way stage right for upright piano, far back for organ, and all the way stage left for piano. 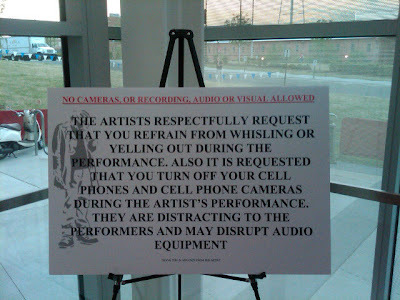 The sound (vibrations) is the gnarliest thing about the show, so you'll be fine sitting anywhere. Now I really can't wait to see him in Detroit, MI. May 4th!! It will be the first I get to see him. Hopefully Neil and crew are safe given the storms in both areas, Durham and Virginia, anyone heard? I was just wondering the same thing...hope that Neil and crew made it through safely. Thoughts and prayers are with all the folks affected, and kudos to the Lowes manager who saved many in his store from harm. The tornado tore through an area less than 50 miles south of the Durham/Chapel Hill area. I've travelled numerous times through the Carolinas and have been there when a tornado hit -- camping in a tent on Hunting Island! Hope that everyone going tonight has a great time...see you in Boston! Do they have unique posters for each city for this tour??? Neil on Record Store day!!!!!!! But next year we want a NY 12 inch with 3 new songs! Why not? It was a good day after all. And it works! Really enjoyed it,.... like Neil and Elliot did. My my, hey, hey! Neil Young spent his Record Store Day dropping by Plan 9 in Richmond, where he purused the bins and spun a vinyl copy of his upcoming new album "A Treasure" (which sounds awesome by the way!). Thrasher? Are you okay? You got tickets for the Richmond concert? Hope you arrived there in good shape. Bit worried because there is no NY Richmond Reviews up here. Hope you are in some kind of record store playing old Buffalo Springfield records. Great show! I wrote about it at our website, Every Second of Every Day.